This isn't engrish, just a very stuckup no smoking sign. Apparently, the indulgent luxury of a Camel is unappreciated by these inelegant hayseeds. But dash it all Jeeves, I need the old gasper now! 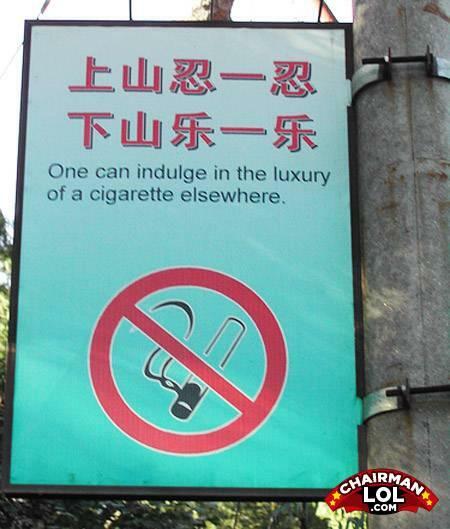 One can also indulge in the luxury of lung cancer at any hospital. Give the guy a break, obviously he tries to quit. Seriously, what's wrong with "No Smoking"? Little Johnny asks his teacher "What's 23 times 3?" She yelled, "Be quiet, Johnny, and grow up!"